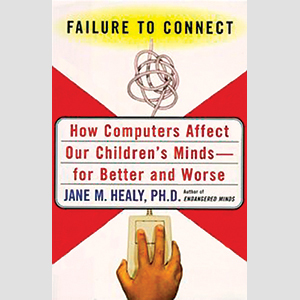 With schools spending billions on technology while simultaneously cutting funding for the arts and physical education, Jane M. Healy, author of Failure to Connect: How Computers Affect Our Children’s Minds – for Better and Worse, questions whether computers are really helping children’s development. Many have jumped on the technology bandwagon; however, Healy warns parents and even educators who have come to believe computer skills rival reading and math. As far as Healy is concerned, unless implemented by properly trained teachers and parents, computers can actually shortchange your children’s future, as it draws children away from other developmentally important activities as reading, hobbies, and creative play. That’s why the American Academy of Pediatricians recommends no screen time before the age of two and less than one hour of screen time for older, school-aged children. That’s television, computer, and iPad combined! Sadly, most parents totally ignore this recommendation, failing to recognize that no research exists to support the edutainment technology offers. In fact, the little research that does exist actually suggests a negative impact of technology on our children, which is why Healy’s book examines the four potential physical risks to the developing child: the visual problems, the postural and skeletal problems, the dangers of radiation, and the displacement of normal physical activities of childhood and adolescence. Just because children like something does not mean it is good for them. Learning is fun but it is also hard work. Accessing isolated information has nothing to do with true learning, which requires making meaningful connections between facts and ideas. Some of the ‘habits of mind’ fostered by technology are dangerous to wit: impulsivity, trial-and-error guessing over thoughtful problem-solving, disregard of consequences, and expectation of overly easy pleasure. Ereaders aren’t any better off. Instead of a white piece of paper with black print, the illuminated screen, which continually refreshes so the image doesn’t fade, stresses both the visual system and the brain. Couple this with the fact that “video display terminals emit both very-low-frequency and extremely-low-frequency electromagnetic radiation” and our children are potentially in for all kinds of problems. Since Healy wrote Failure to Connect, numerous health experts and developmental psychologists continue to express grave concerns about this dangerous trend. Unfortunately, despite the warnings, more and more parents not only permit their children to constantly turn to technology but also encourage it. Therefore, it should come as no surprise to learn the child’s mind is growing just as endangered as much as the outdoors he ignores. Read my other blog Befriending Forty.